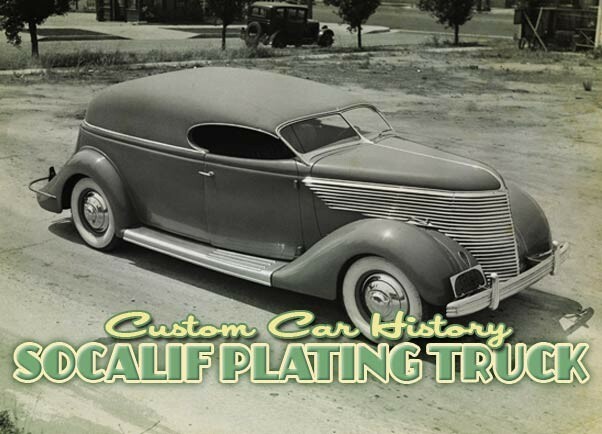 George DuVall designed the 1935 Ford for the So California Plating Company and it turned out to be one of the most outstanding early Custom Cars. The first time I saw a photo of the So Calif. Plating Co. truck was in the Flying V’s article by Dean Batchelor and Pat Ganahl in the August 1990 issue of Rod & Custom Magazine. The article showed three black and white photos of this amazing car/truck. One with the midget on the trailer behind it, from a bit higher point of view was shown in a nice size, and two others rather small. And there was quite a bit of written info about it as well. I thought that 1935 Ford was one of the most beautiful Customs I had ever seen. With its wonderful slanted DuVall windshield and long and low padded Top, large white wall tires with chrome hubcaps and that amazing hand made grille. Stunning. I could not believe no more 35-38 Fords were styled like this one, it was so beautiful, in my eyes everything was right about this car. Later I started to collect every bit of info and photos from this car I could find. In en email conversation in 2006 , Pat mentioned he was working on article about the SoCalif Plating Co. truck for the Rodder’s Journal, and how he had found some new images and some very interesting info on the car. 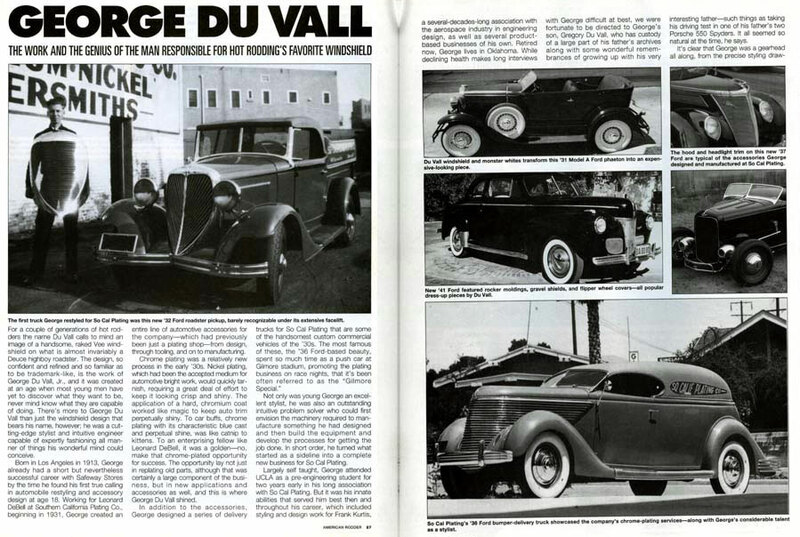 In the summer of 2007 that article was published in the Rodder’s Journal #36. And it is an incredible article with a load of new information on this car the enthusiast had been waiting for for a long time. 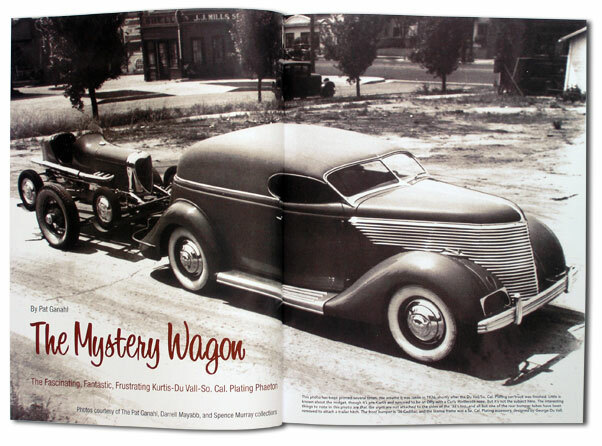 If you have not read it, and love custom car history, you better get a back issue for your collection. The American Rodder published an article about George DuVall in 1997 which featured another nice never before seen photo of the SoCalif Plating truck. The American Rodder article also shared this amazing sketch George DuVall created for the SoCalif Plating truck he designed for Leonard DeBell’s 1935 Ford. The overall shape is all there, but the details as the grille, and bumpers are different from what was actually build. 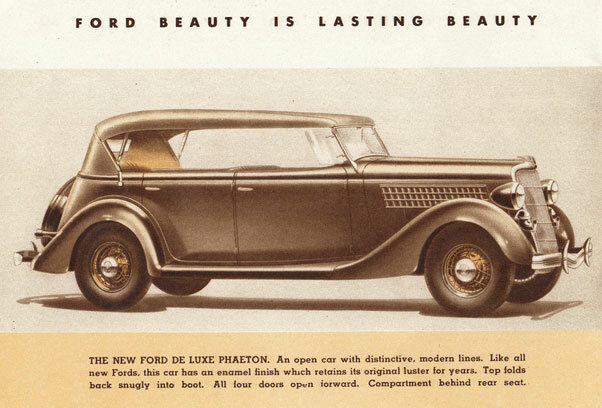 A 1935 Ford Phaeton from the Ford Sales Brochure. 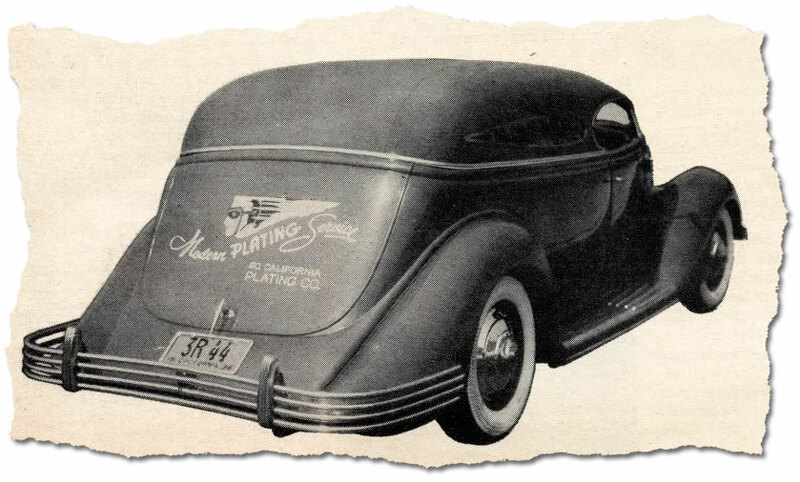 A car like this was the base for the SoCalif Plating Co. Truck. The 1935 SoCali. Plating Co. Truck has always been a great inspiration for me. 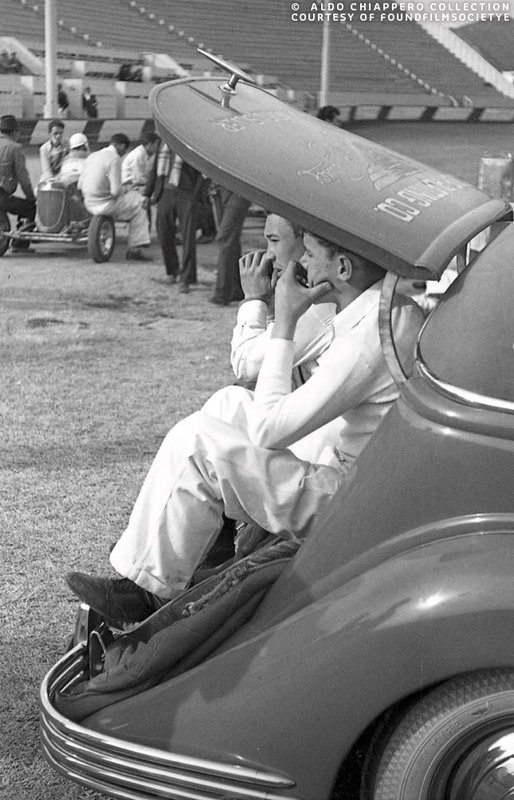 When I looked at the photos of the Custom, especially the one with the midget behind it, and the old cars in the background I could not stop wondering how much impact this car must have had back in the late 1930’s and early 1940’s. It must have looked like it came from outer space to some. The car was so far ahead styling wise. As Pat Ganahl mentioned in his RJ article it is really a wonder that there are no old magazine or news paper articles about this car. The only thing I can imagine is that everybody who saw the Custom during the day trips to deliver fresh chrome, or in the weekends at the race track, was to much in awe to even take pictures, let alone think about doing something about it for an early magazine or newspaper. As far as I have been able to find out it was not until 1955 before the first photos of the Custom appeared in a magazine. 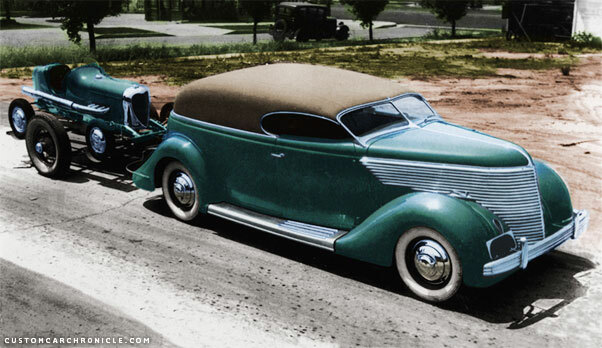 In the 1930’s and early 1940’s the Custom Cars where created for other reasons than during the golden years of Custom Cars (late 1940, to late 1950’s). There where no cars show to enter your Custom in, no reason to modify something to gain extra points. 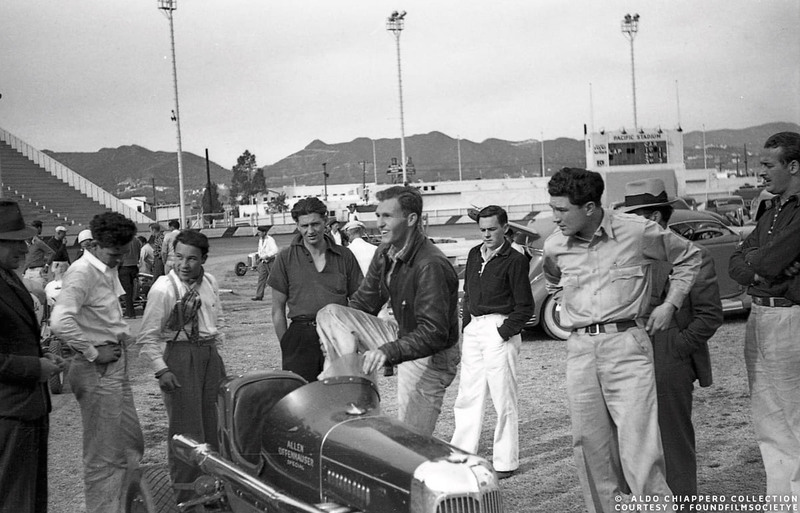 These Early Customs were designed to improve over the original designs of the cars they are based on. They were designed to look more exclusive, more expensive, and perhaps more powerful. And in this case the car was designed as a working truck. A full Custom Car with a exceptional amount of work done knowing the end product would be used on the road 7 days a week! Because the Custom has been built so long ago a lot of real facts about the car have been forgotten, and the people who might have remembered are no longer with us to ask about it. 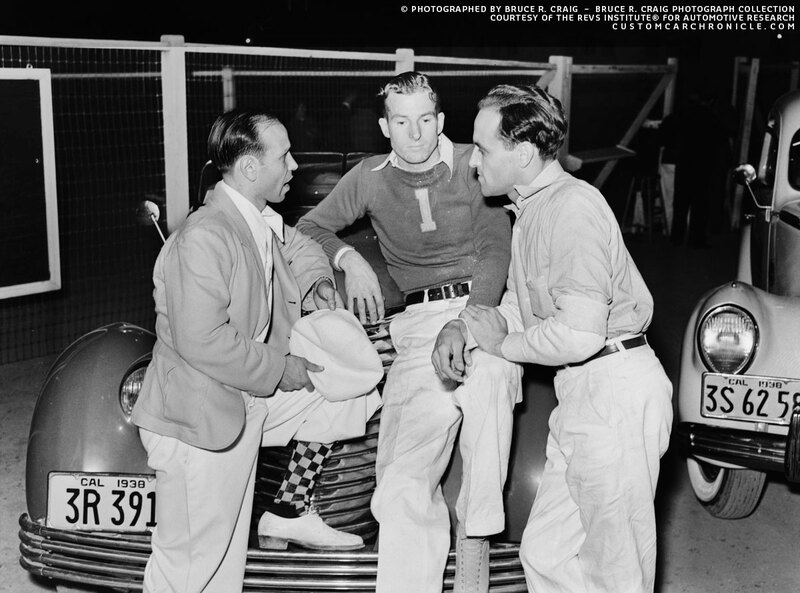 But with the several articles on the car, and memories shared by the people involved in the creation of the car over the years, a lot of history about how it was created has fortunately been documented. 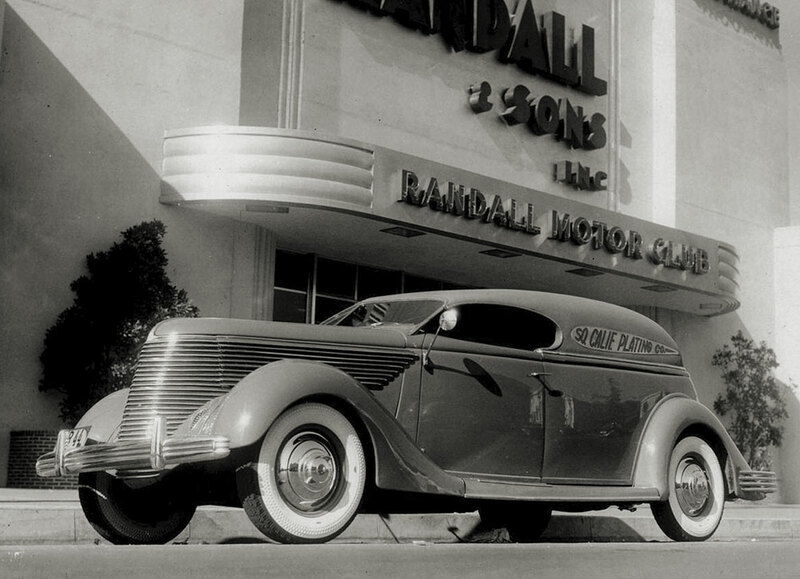 The car was commissioned by Leonard K. DeBell, owner of the So Calif Plating Co. who had bought a brand new 1935 Ford phaeton. His plan was to use it as a very classy delivery truck. But to be able to do that the car had to be lengthened 12 inches to assure freshly chromed bumpers could be stalled behind the front seat cargo section. George DuVall had been employed by DeBell since 1933. 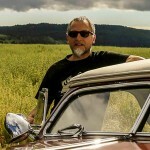 He was hired to design and develop new chrome plated aftermarket parts for the company, and as part of this he had already designed and build several company pick up trucks. It is unsure who all worked on this truck, and who did what, but from the archived documents we know that George was of course responsible for the design. We do not know who actually added the 12 inches to the frame, and welded the rear doors before extending them with 12 inches. Some people say it was the George DuVall – Frank Kurtis team who did this, others say Jimmy Summers might have done some of the body work. George and his friend Frank Kurtis created the grille from brass sheets, bend to shape. It has been described as a lazy “Z” shaped sections that form the actual grille bars. One bend and shaped all the separate unit where chrome plated and installed. George did an absolutely fantastic job integrating the new grille with the 36 Ford body work. George also created the V-Windshield that would later be his most popular product. The typical V-shaped windshield with the thin posts and wonderful lines which would later be used on many Hot Rods and Custom cars was specifically designed for this 1935 Ford. We also know that the rear door, which hinged at the top, was created by Chad Schultz of Joe Newell’s body shop. The door could also be removed easily when larger parts needed to be transported. The rear door gave access to a flat floor that started just behind the front seats. So there was actually quite a lot of space for product. But it might perhaps not have been as handy as an actual pick up truck like the previous So Calif. Plating Co. trucks were. However DeBell liked the idea to promote his business, and knew that the good looks of this truck would help him sell more product. 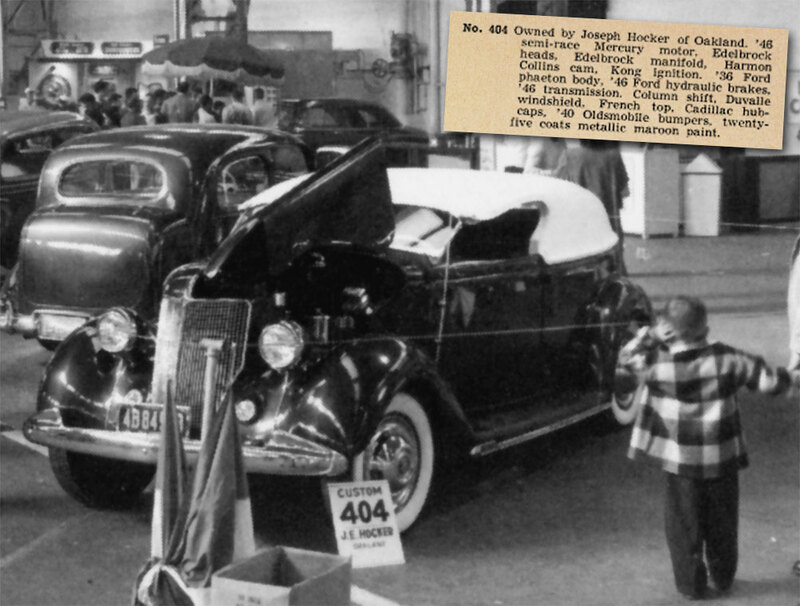 After the frame and body had been extended 12 inches DeBell bought a set of fenders, hood sides and radiator shell from the brand new 1936 Ford directly from the dealer. He liked the shape of them better than from the 1935 Ford. It looks like the new 12 inch longer running boards are made out of stainless steel, and that the four step on strips on them are actually integrated, pressed in the units, rather than using separate strips. At least the new high res photos give us the impression they are. 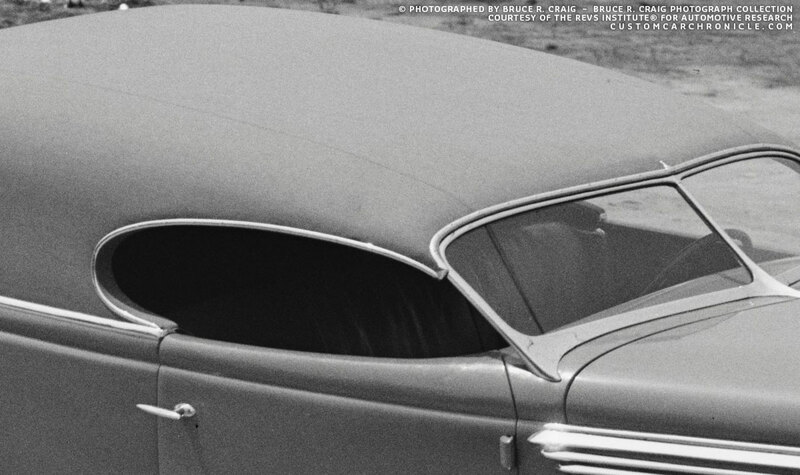 Another photo taken at the same location from the Revs Institute Collection gives us a good view at the rear of the car. My guess is that the tubular rear bumper might not have been finished when these photos were taken. 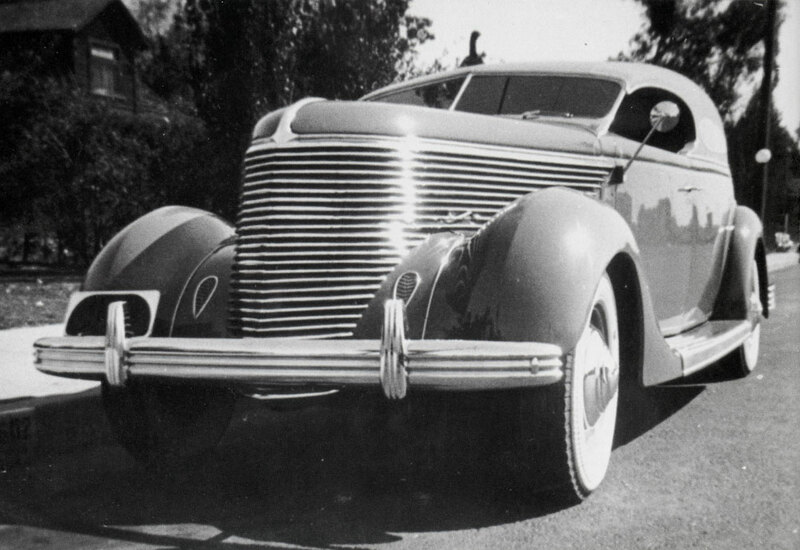 DuVall added a 1936 Cadillac bumper to the front and created small teardrop shaped headlights, more like paring lights. 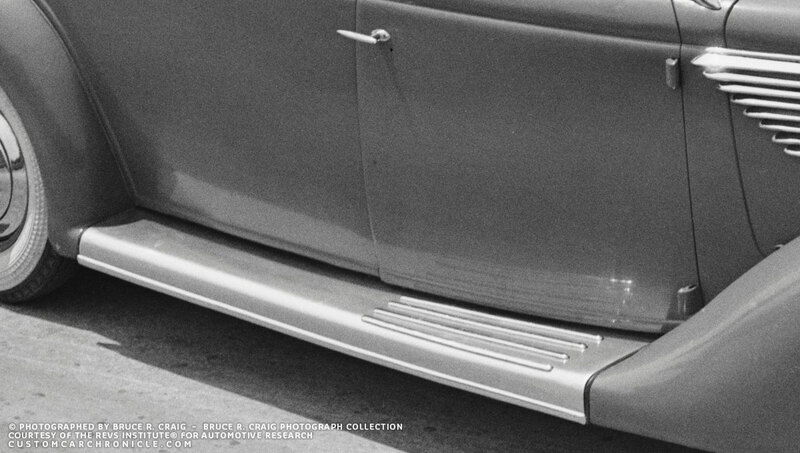 At the rear a four bar bend chrome tubular bumper with cone shaped ends was created. A single taillight was mounted below the lower pan mounted license plate. I have not been able to fin a gas filler car on the photos I have seen on the car. Possibly this was moved into the cargo section? With all the body work done the car was painted in the So Calif. Plating Co. Sea Foam Green color by Charlie Remidi. A very unusual color for a car back then. The color is sometimes described as a gray green color, others have mentioned it had a sort of olive tint to it. 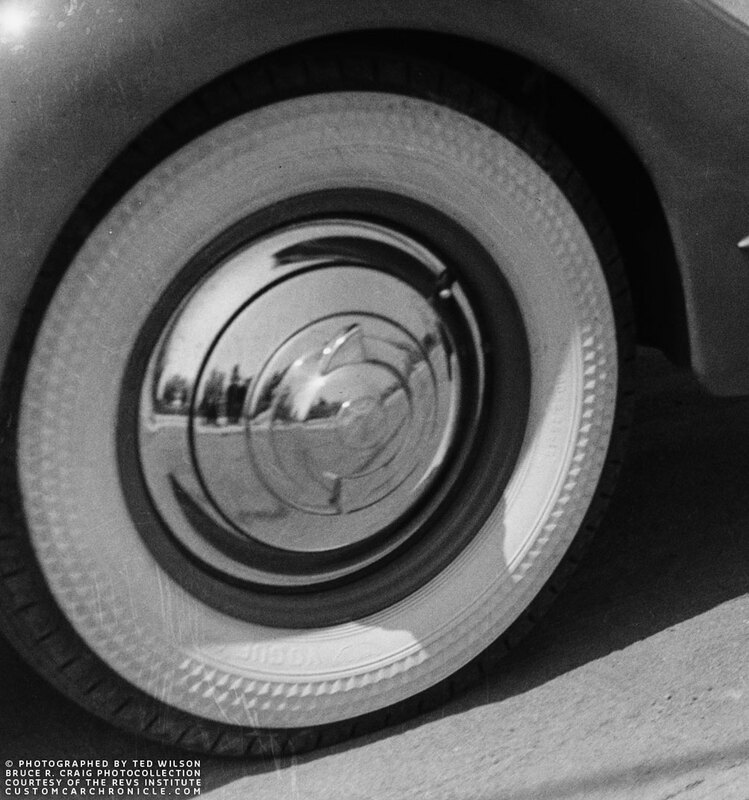 George Du Valle created a set of ribbed wheel covers to cover the wire wheels, and they were dressed up with some fake knock-offs. Unsure is if the hubcaps were designed for the truck, or if they were already in production by the company. The wire wheels were fitted with large Vogue white wall tires Vogue. It took them a total of three month to create this Custom Car mater-piece. The long and wonderful padded top was create by the George Thomas Top Shop in Hollywood. He created a top that fitted the DuVall windshield perfectly and the teardrop shaped side window openings give the car instant speed. We are not sure why there was never an rear window created in the top. Driving the long car with blind rear must not have been easy. But on the other hand this was late 1930’s and the roads were of course not as crowded as they are now. Rear 3/4 view shows the amazing lines of this car. Everything about it is just right. This photo shows the unfinished rear bumper, and the hitch sitting in front of the bumper coming from underneath the rear pan. It appears that the rear fenders and lower rear panel have been extended, possibly to make space for a lower position of the gas-tank, so that the cargo floor could be flat, and lower. 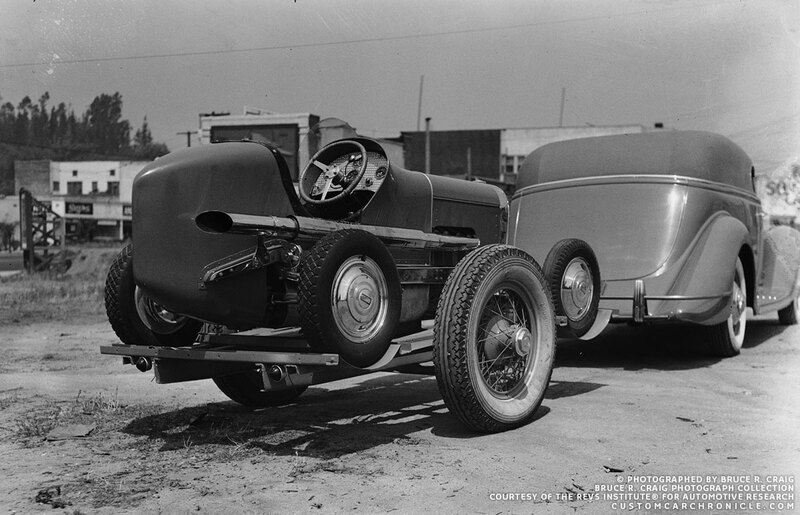 The photographer might have been more interested in the Midget than the truck, hence the cut off front fender. 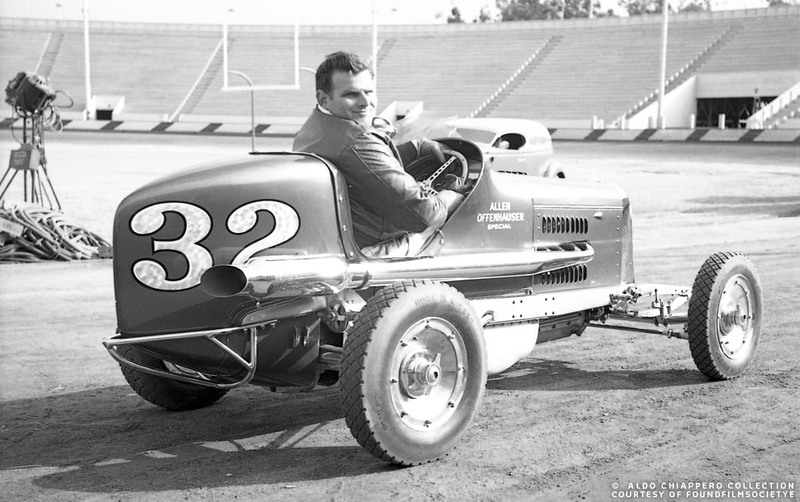 This photo of the midget does give us a good look at the unique Vogue white wall tires and the Chrome disk with “knock-offs” covering the wire wheels. Notice the small peak at the center of the top visually extending the windshield center. The fit of the windshield to cowl, and the top to the windshield is really flawless. The DuVall windshield is made up from 5 separate brass casted parts. Before these photos became available all we had were the photos that appeared to have been copied form the original photo, and were rather dark. I always thought the extended running boards were a slightly different color, or shade than the rest of the car, and for sure not covered with rummer. But these high res photos make it look like the running boards were actually made from shaped stainless steel with the four step on ribs pressed in them, rather than them being separate strips. George DuVall really did an amazing job on the design of this car. The V-windshield is absolutely gorgeous, but how about the grille bars extending to the hood sides, and even a little bit on the cowl. Look how they are beautifully rounded at the end, and the way to overlap on the cowl, make the hood look longer than it actually is. Another detail I had never notice before is the side trim t the top of the hood side, below the hood. 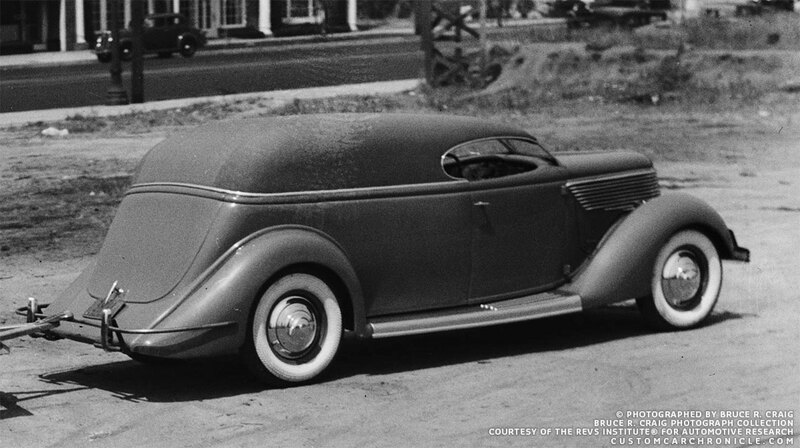 The 1935-36 Fords never had side trim, but if you look at the image below you will see it makes total sense for it to be placed there. 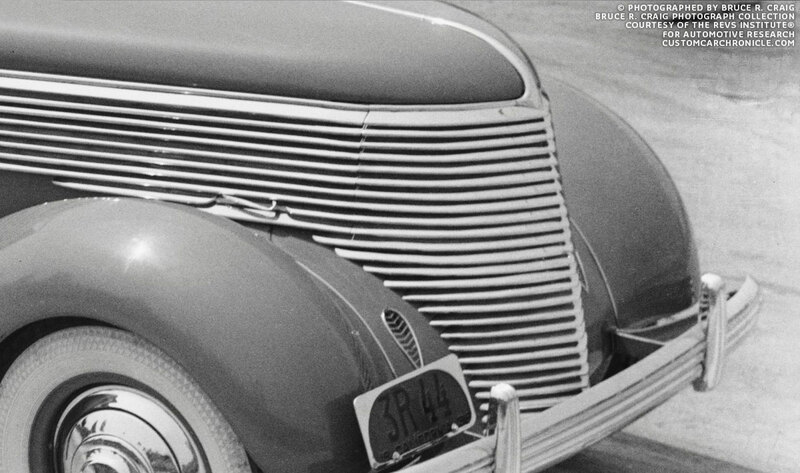 A close up on the front of the car shows the very small headlights intergrated in the front fenders, the 1936 Cadillac bumper, the oval shaped license plate frame and of course the beautiful shaped and created grille. This photo also shows where the top side trim seen in the previous photo comes from. 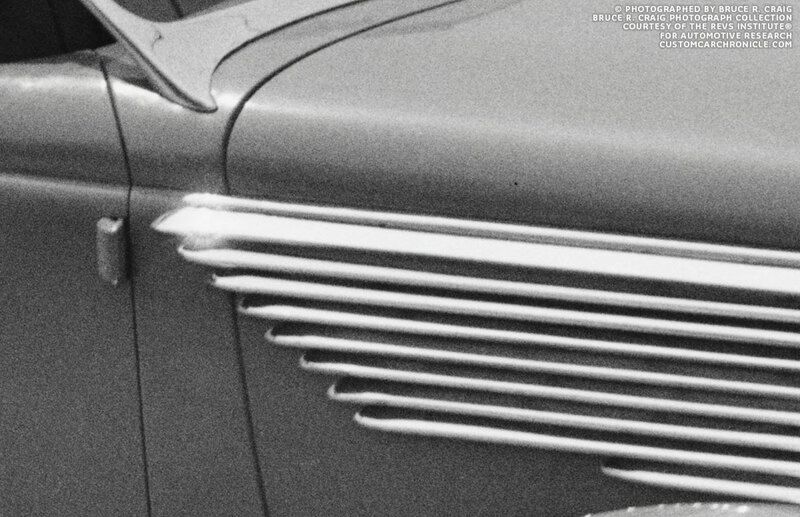 The original 1936 Ford nose/grille piece was used, and the trim is actually in place of the original 1936 Ford grille surround. The oval shaped license plate cover might have been another DuVall- So Calif. Plating Co. product. The plate is from 1936. The beautiful patter on the Vogue white wall tires is clearly visible in this photo. It appear that the custom hubcap covering the (most likely) wire wheels is made up of at least two separate pieces, possibly even three, or four if the “Knock off” comes off. 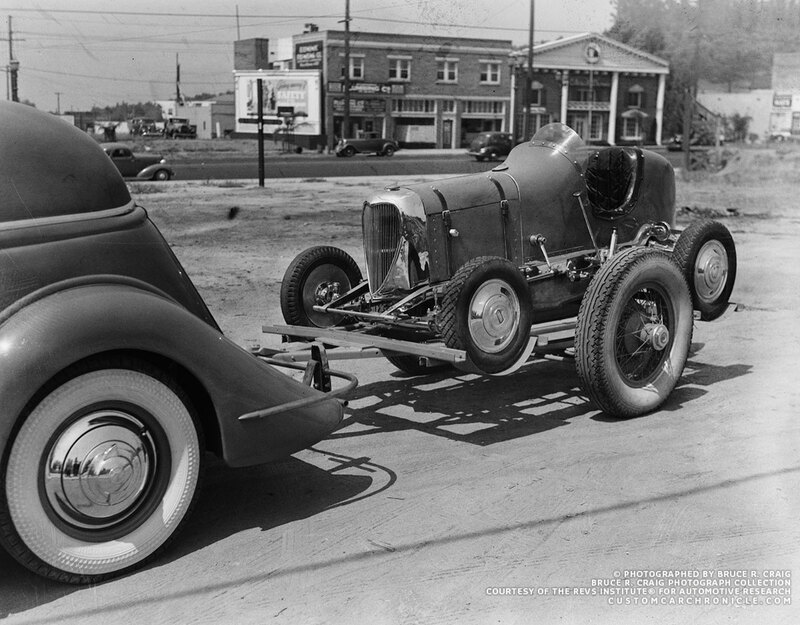 By looking good at all the photos it appears to me that the photos taken with the midget on the trailer and similar once at the same location where taken in early 1936 when the car was freshly done, and not yet 100% finished. The rear bumper is still unfinished in thos photos, and there are no side view mirrors mounted. 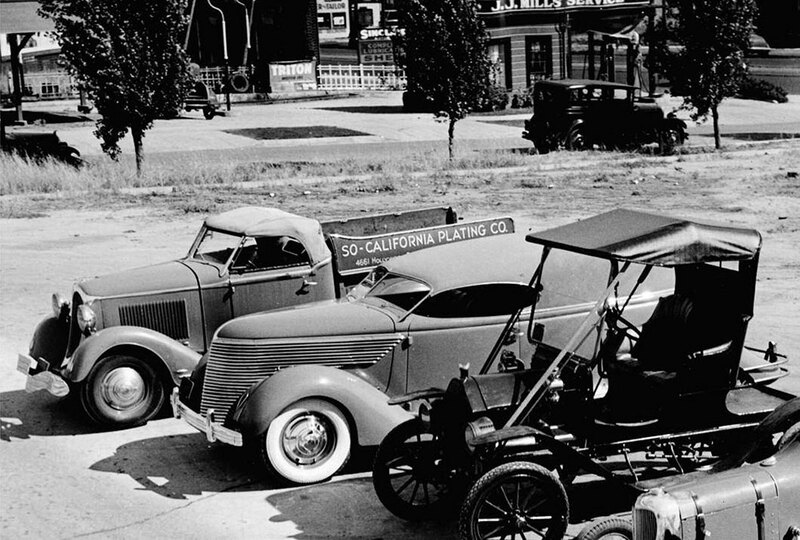 Here the ’35 truck can be seen parked with an older So-California Plating Co. truck, which was based on an 1934 Ford pick up truck, dressed up with DuVall designed chrome hardware. This photo from the rear, and the next one show the finished tubular bumper really well. 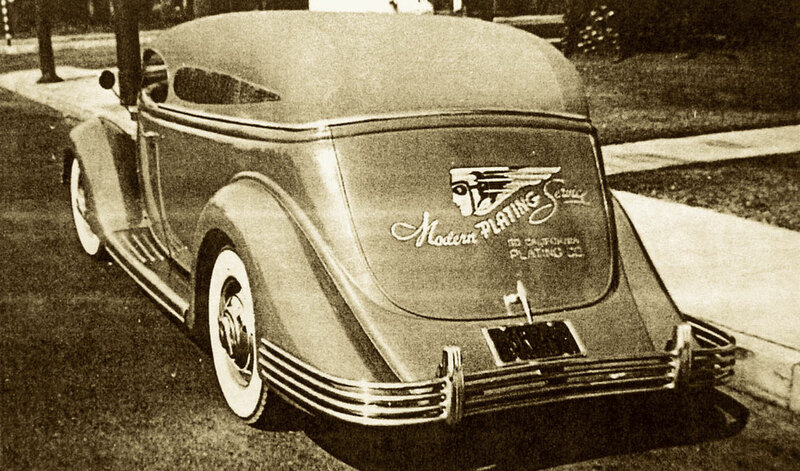 The bumper guards are the same as from the front bumper, 1936 Cadillac. And it appears that there is just one singe taillights mounted behind the bumper, below the license plate. Most likelely the hitch used for the weekend midget trailer was a removable one. By now the trunk has been decorated with a Modern Plating Service logo. And the top sides have the S0 Calif. Plating Co. teardrop sign added. All the photos taken after the midget trailer photo session show the car with hinge mounted side view mirrors, but left and right. This front angle photo shows the teardrop shaped very small headlights. They are rumored to be Woodlite headlights. But the shape of those does not really matches these units. The low angle gives the car a wonderful aggressive look. A wonderful low angle photo shows the wonderful Art-Doco styling on the car, which goes perfect with the building in the background. May 1955 issue of Motor Life magazine most likely is the first time the SoCalif. Plating Company truck was ever published. It appears that the photos are taken in 1936. 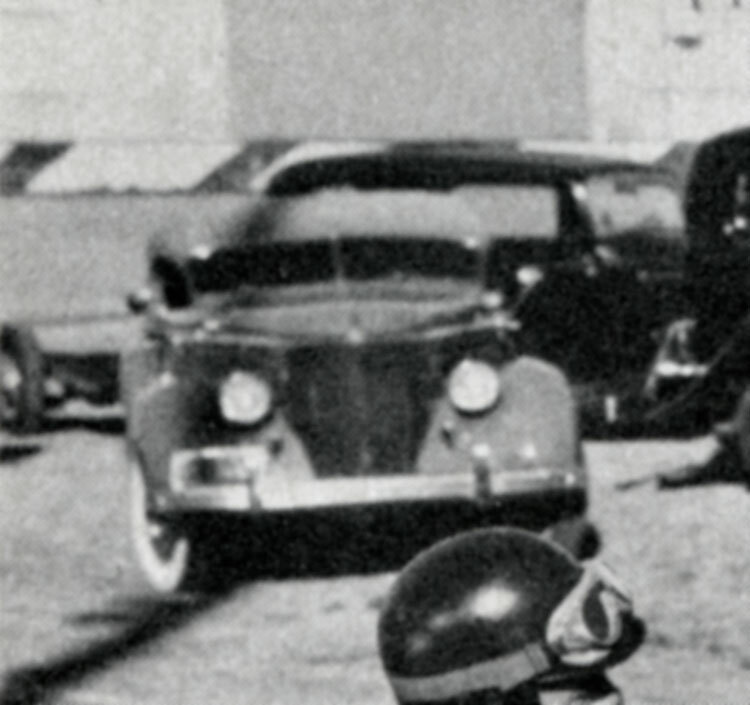 The rear quarter photo clearly shows the 1936 California license plates. It also apears that the car did not yet have the hinge mounted mirrors added when these photos were taken. 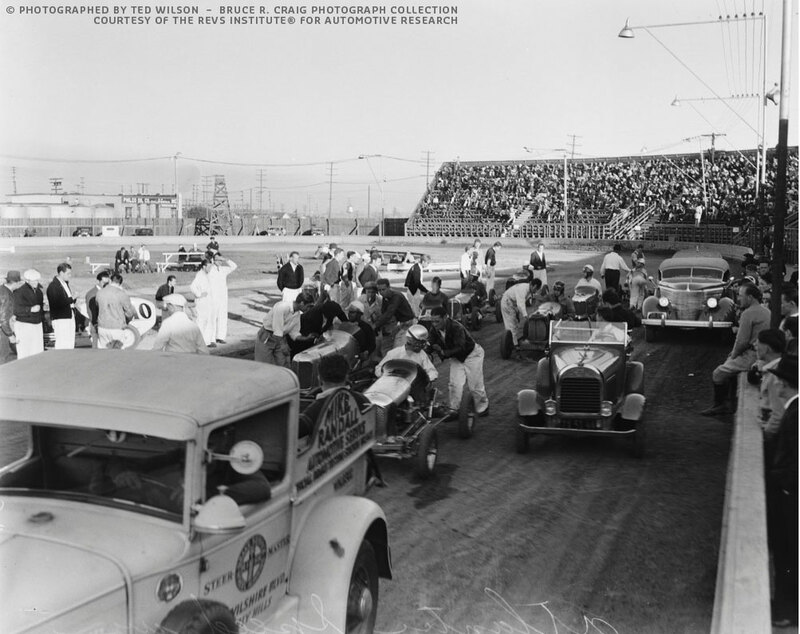 Snapshot taken at a midget race in 1937 at an unknown stadium. Very interesting photo shows the chrome plated hand made hinges for the custom made deck lid. Enlarged section from photo above shows a little bit of the car’s dash, and the deck lid hinges again. 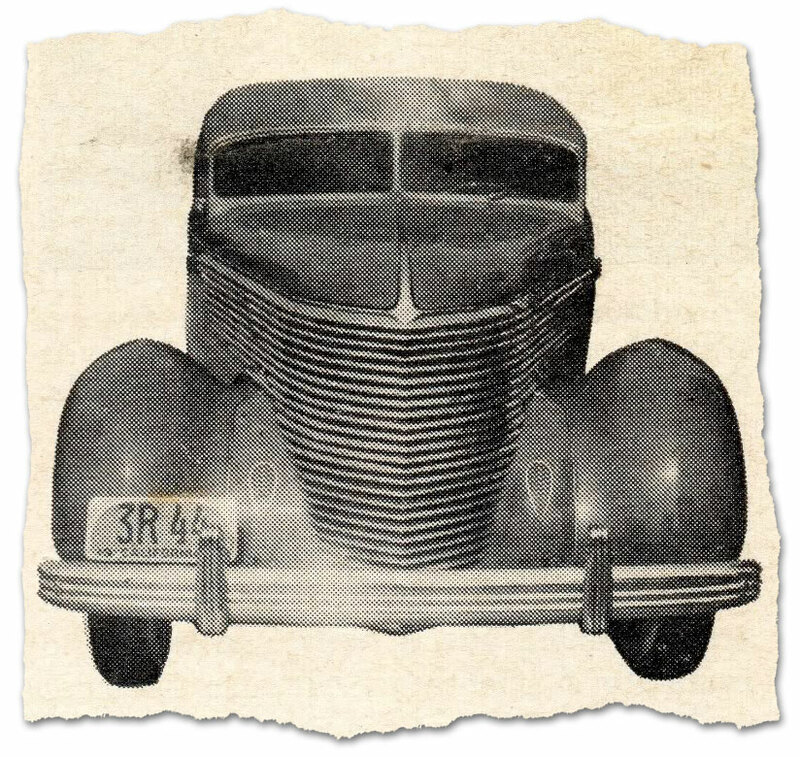 Somewhere in the late 1930’s or early 1940’s the car was updated with a set of low mounted, or perhaps molded in headlights. Most likely done by Jimmy Summers. Apparently there have been a few, perhaps as many as three SoCalif Plating Co. trucks with a similar design during the late 1930’s. There is more information about this in the Pat Ganahl Rodder’s Journal article. The article also covers what might have happened to to car, that it might have been in use up to the mid 1950’s and that if might have been seen as late as the mid 1960’s sitting in a shop on Melrose. And that the car might possibly still be around today. I really hope so, and I really hope it will be “found” and shared with the public again. A rather fuzzy photo, actually only a small portion of it, enlarged, shows the truck with the new headlights. 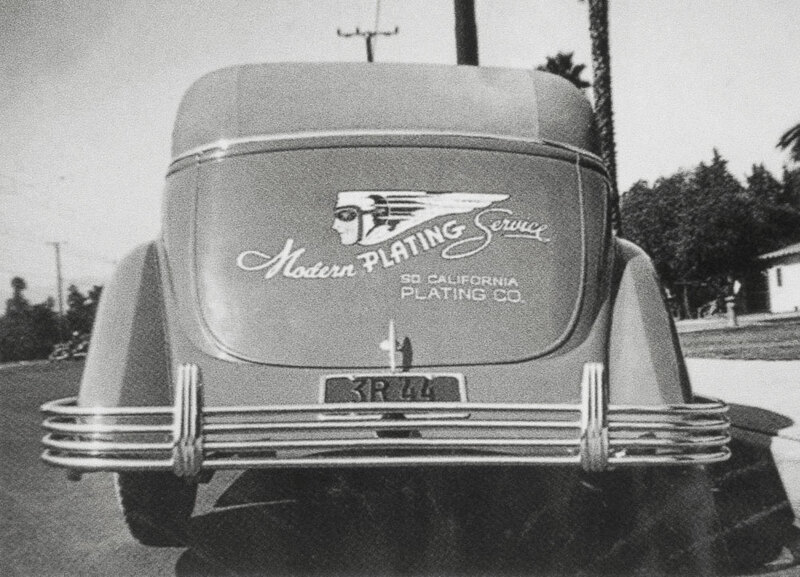 The Revs Institute for automotive research has another very interesting photo in their collection showing the front of the 1935 SoCalif Plating truck. This time with the new headlights added. We can see clearly that the original headlights are still in place and the new headlights are not molded into the front fenders. Sadly the photo is not dated. Note that the trunk lid is open in this photo. This is the complete photo taken by Ted Wilson with the SoCalif truck on far right. 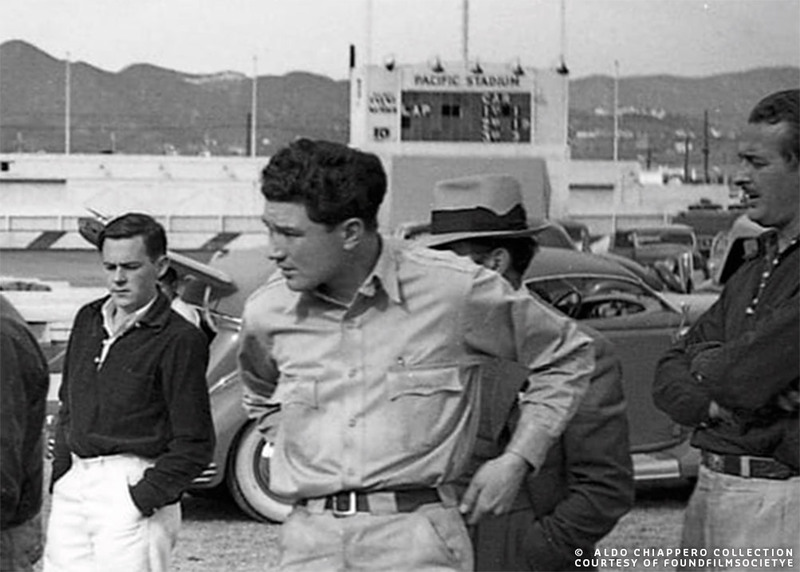 Judging the other tow cars and race cars on the Atlantic Speedway, South Gate, California, track it looks like this photo is taken in the late 1930’s. Parked on the inside of the track with the trunk door open. 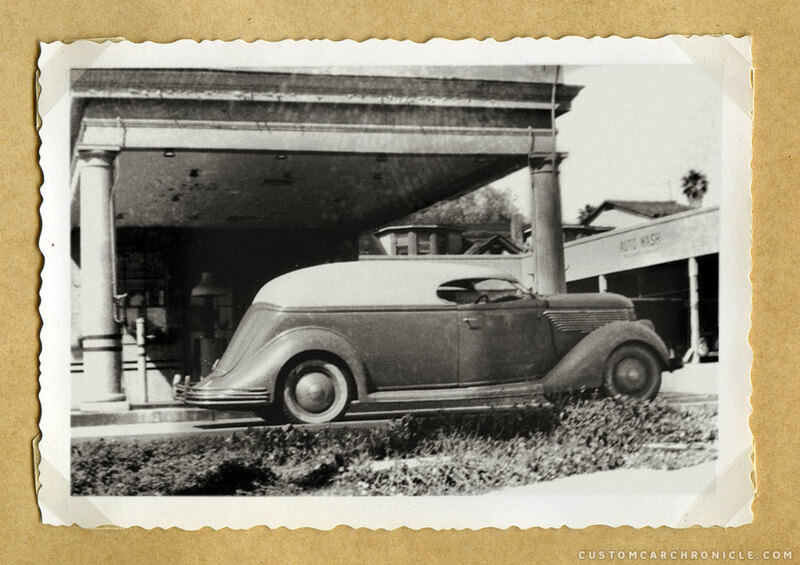 This is supposedly the last known photo of the car, taken by Spencer Murray in March 1944 at 5229 Sunset Blvd. Los Angeles. It appears that the hubcaps might have been changed, and the white wall tires look to be less tall. And it also looks like the padded top has been recovered with a lighter material. Although the last might only look that way due to a light overexposure. In this photo we can also see the added headlight, which were done by Jimmy Summers. But there still is no real evidence of the rear lights. At one point I set out to do a colorized photo of the SoCalif. Plating Co. truck. But at the time all I had was a rather poor scan of a to dark copy of the photo. So I did get it started, but never really finished it with any details. Still nice to see some color on the car. It still makes me wonder how spectacular this one must have looked like in color with all the bright chrome. 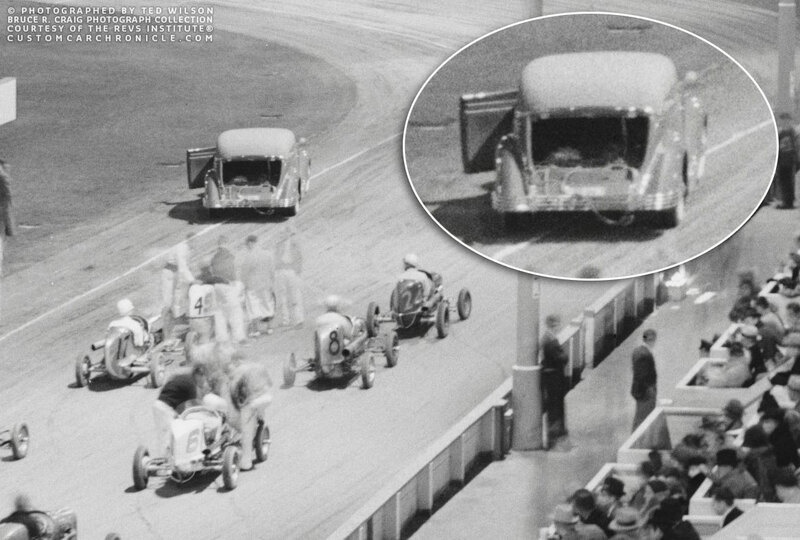 I really love the 1936 photo of the car taken from a bit higher point of view, but always wondered how it would have looked without the trailer behind it. So when I came across the Revs Institute scan of the original photo I had to do some photo shop work to set the car alone, all by itself.. and I think it looks absolutely amazing. 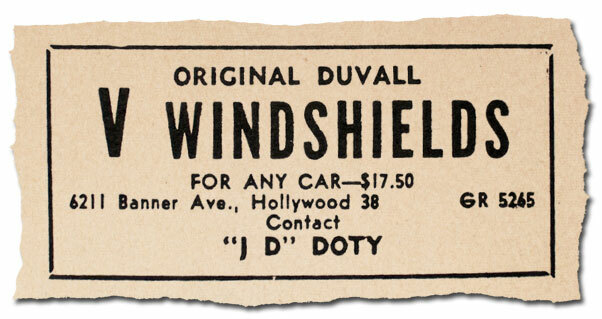 Julian Doty took over the patterns and rights to cast the DuVall V-Windshield in 1946. Here is an late 1940’s ad he ran. The windshield was one of the most popular items DuVall designed, and it all started with the SoCalif. Plating Co. truck. 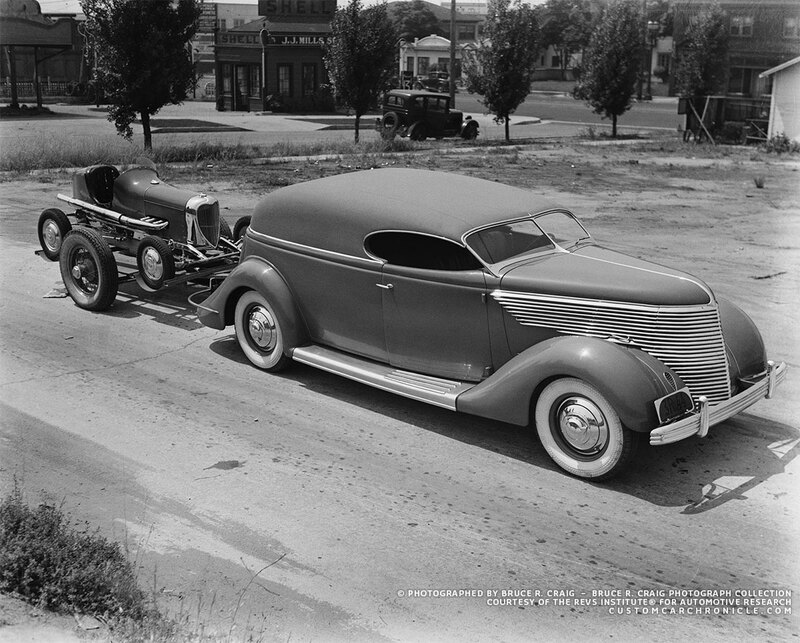 One of the cars most likely inspired by the SoCalif Plating truck was this 1936 Ford owned by Joseph Hocker. DuVall windshield and white padded top. Although the top is not as nicely shaped as the one on the original one. 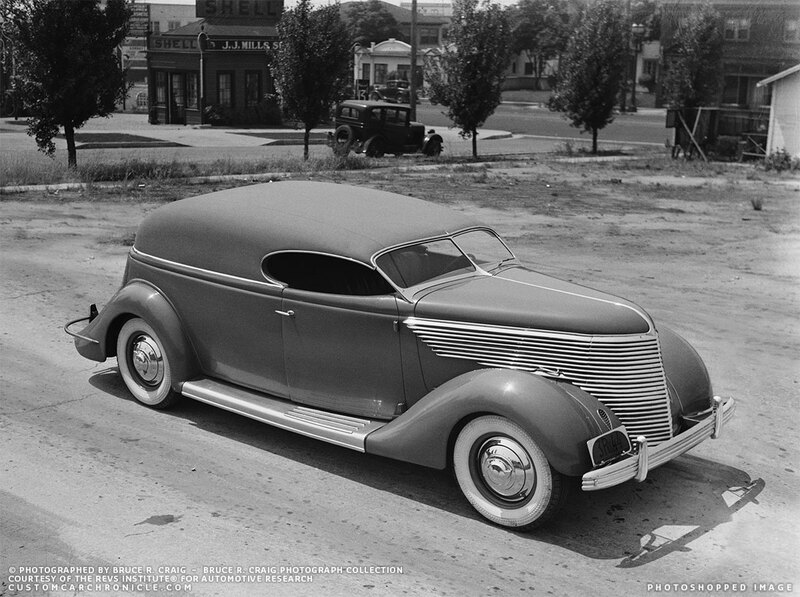 Another one based on a 1936 Ford also shows a lot of similarities with the DuVall designed Custom. This version has the running boards removed. Over the years several projects have been started recreating, semi recreating or inspired by the So Calif Plating Co. truck have been started. But so far none of them have been finished as far as I know. 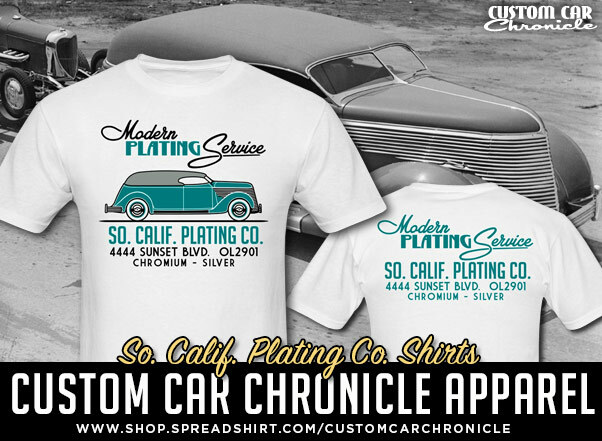 Back in the 1940’s there were a few 1936 Fords inspired by the SoCalif Plating Co. truck. At least two of them are documented. Hopefully new creations inspired by it will be created, or finished in the near future. This 1935 Ford designed by George DuVall has played a huge roll in the history of the Custom Car. And I think we all have to be very happy that there are so many photos of it taken back in the 1930’s, and that so many have survived and are being shared. 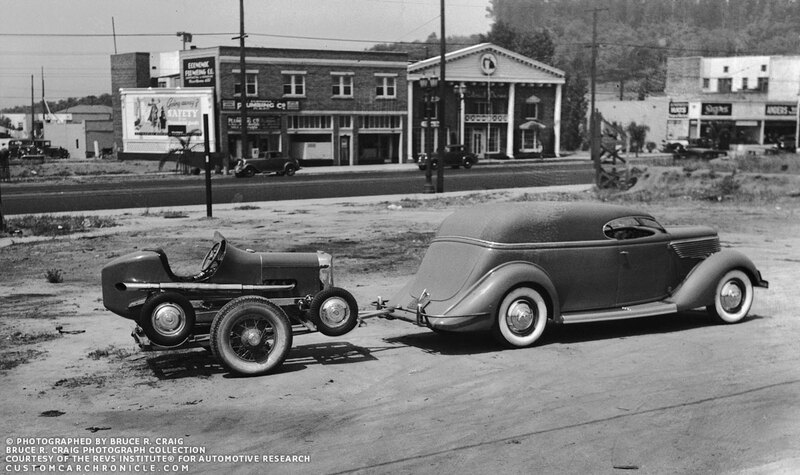 Here is an interesting photo showing another So-Cal-Plating “truck” Based on a late 1936 Ford Convertible Sedan. Pat Ganahl’s Rodder’s Journal article showed a rear angle of this car, and the Revs Collection gives us a bit of an front view. 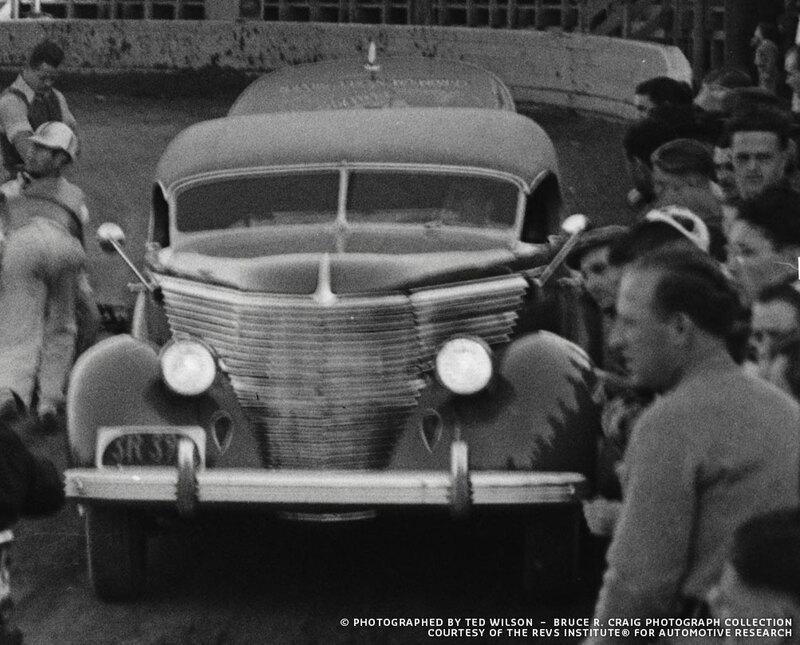 There is no top on the car when this photo was taken, and the grille bars look to be a taller and less in number than on the original 1935 based car. The front bumper is also quite different. According the Revs site the guys in the photo are: Dominic Distarce, Sam Hanks and Karl Young. Earlier So California Plating Company trucks CCC-Article. I really love this car and have done so from the first time saw it. The grillbars,extended wheelbase and shape of the padded top is perfect in my eyes.Can only imagine how it must have been driving it in the dark with those headlights. Probably a real nightmare and thats why it was added with bigger ones later.Noticed the doorhandles is turned 180 degrees and pointing backwards. Was that to give it a more streamlined look. 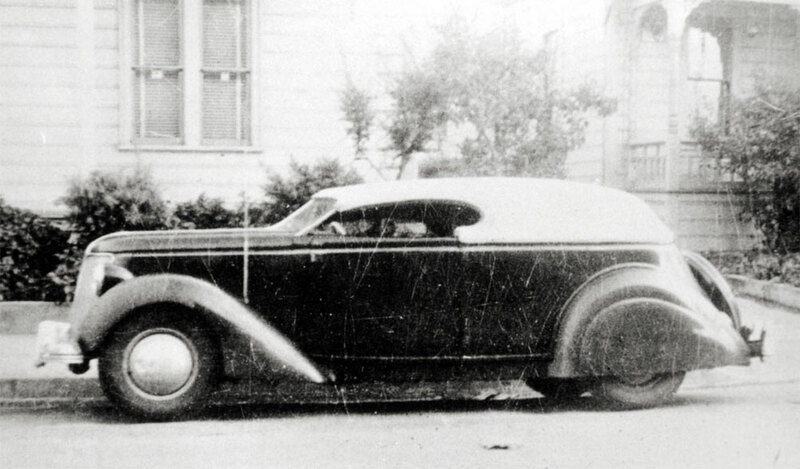 The same thing was done on the Pierson brothers 36 coupe also. One thing I´ve been thinking of many times is how it would´ve looked like with a set of skirts on it. Thanks for bringing this one up Rik and if it´s still alive somewhere I really hope it will show up in public. Great notice on the door handles Kenneth.. I totally missed that detail. Fantastic sleak early custom design , a clear favorit , thanks for this dynamite article . I recently got hold of a second -36 Cad bumper for my buddy in California that I brough one 10 years ago and we have been on the lookout for its match ever since , hard bumpers to find , I looked around and those bumpers origin and figured they came off -36 Cad series 60 and 70 , not LaSalle and V16 . 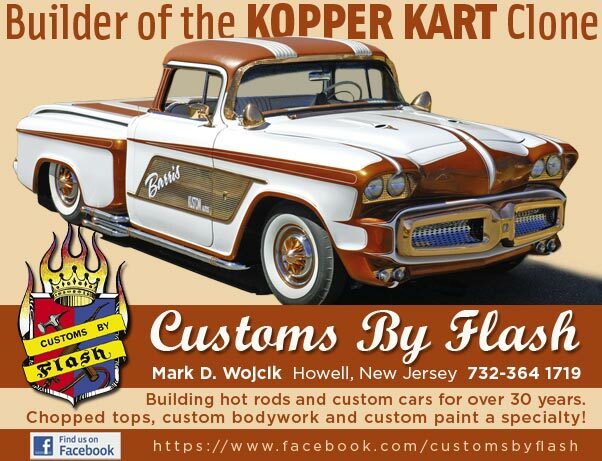 Thanks again for the insightful analysis of a seminal custom by a true icon of traditional customs, and hot rods. The George DuVall windshield frame is pure art. And the overall design just flows. From sketches to hand-formed pieces to fit the vision, we have a rare peek into the genius that was George DuVall. Great job on the story Rik and gang….!! This one of my all time favs…..This kustom looks like no other and is amazing. It has it all in one from the period of customs……..This is a car I wish some one would find……… I often wonder what happened to it………. Alos Rik I don’t know were you find them but the 6th photo down showing the side view with the street and buildings behind it I have never seen before…..What an amazing pic…..!!! Thanks Rik for putting this together. That second car really intrigues me. You can see it also had some of the same custom touches as the first car. I need to get back on my inspired version….